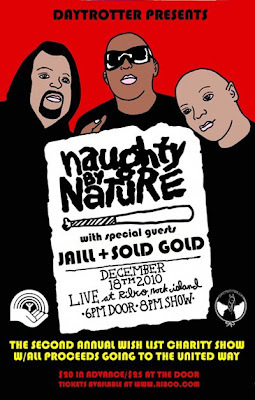 LOL/OMG: Solid Gold and Naughty By Nature? You wish! We definitely LOL'ed at this flier Solid Gold posted on Facebook today. The font used to announce the opening act "Sold Gold" is even slightly similar to a typeface often used by the band. We have to admit, first glance had us saying "WTF!" Unfortunately, this is a bill that we'll likely never see, but on opposite day we'd be first in line for tix! UPDATE: We got official confirmation from a Solid Gold insider that despite the flier typo, this is REAL. The music blog Daytrotter is based out of the quad cities. Solid Gold apparently did a set for them a year ago or so, and they were offered this benefit. Random...and hilar...AND AWESOME! We'll need pix, boys! haha! We got official confirmation - see the update. Random!!! And awesome.